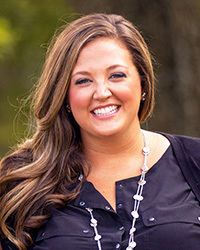 Dr. Amanda Garrison's experience in the field of dentistry began long before she earned her Doctor of Dental Surgery degree from the Ohio State University College of Dentistry. Before completing her professional education, Dr. Garrison learned the basics of good oral health from her mother Missy, a dental hygienist, and her interest in dentistry started at an early age. Starting as a dental assistant in junior high school and continuing to the present day, Dr. Garrison has a passion for the dental industry and her patients. She continues to broaden the scope and depth of her knowledge through ongoing professional education, and she is an active member of American Dental Association, the Ohio Dental Association, the Acedemy of General Dentistry and the Cincinnati Dental Society. Dr. Garrison is carrying on Dr. MacKnight's legacy and looks forward to meeting patients and providing excellent care. It’s not all work and no play. Dr. Garrison is married, and she also enjoys spending time with her Golden Retriever, Lucy. She likes to spend her free time boating and playing tennis to stay active and healthy. During the fall months, Dr. Garrison can be found enjoying a good football game, especially when her beloved Ohio State Buckeyes take the field.